Salesforce Events Reminder : This application helps the user to manage the registered events/celebrations of specific date by sending wishes automatically to the specific. This includes the work anniversary of the employee(user), birthday reminder, marriage anniversary and customer anniversary of the contacts. 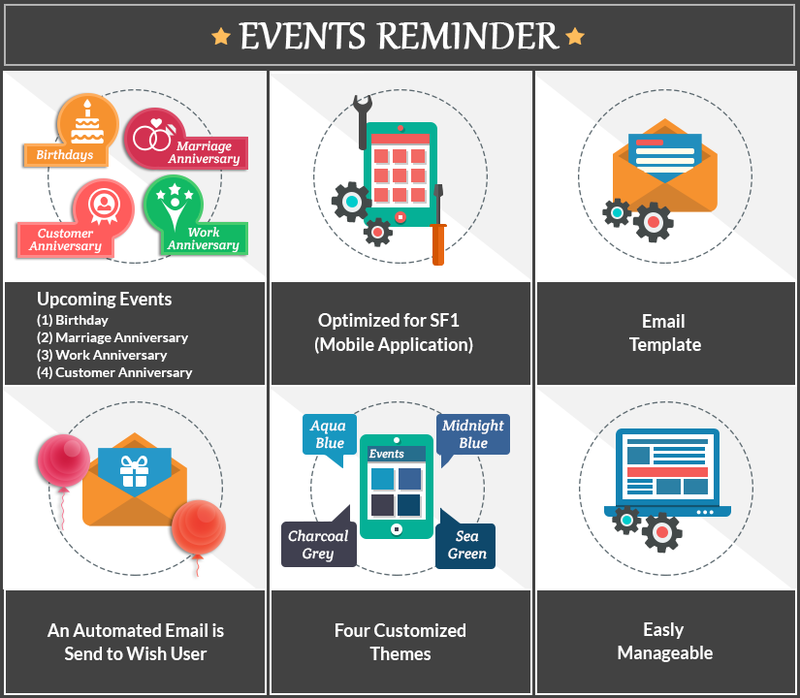 Salesforce Events Reminder- This application helps the user to manage the registered events/celebrations of specific date by sending wishes automatically to the specific. This includes the work anniversary of the employee(user), birthday reminder, marriage anniversary and customer anniversary of the contacts..
Upgraded with Lightning features to explore in all new lightning view. Displays list of upcoming events like birthday and anniversary details. Multiple customized themes individually displaying birthday and annivesray details. Provides you option to select email template as per your choice based on specific events. Helps to automate email notification as per your preferred time. While automating email, provides option to add specific user, Partner or Customer Portal user in CC. Option to display last name of Users and Contacts in the detail list of upcoming events. Feature to filter event list as per Account status like active, inactive or both. Option to view details of upcoming events as ” All Contacts ” or ” My Contacts”. Fully optimized for Salesforce1 mobile app. Did you buy Salesforce Events Reminder? I was searching for a nice and seamless event reminder for Salesforce and found this nice app. I track upcoming birthday and policy anniversary events. I especially like the ability to have this app loaded on the Home Page and also the ability to have the system automatically send out emails when the date arrives - birthday greetings and other customizable messages. Well done Webkul. The app says free but it is $50 per user per year which seems like a fair price. Love this app! It allows me to have the birthdays of my customers very visible. For some reason, the salesforce contact birthday feature does not allow you to see the birthdays in the month by day, so you can easily miss out on a birthday. With this app, I can quickly see if tomorrow or the day after, someone has a birthday, and I can send them an automatic birthday greeting. I also like having the feature of adding another alert, in my case I track graduation dates. This app also helps with that. The price is reasonable and definitely worth it! Great app for Birthday Reminder! Very useful app, works absolutely fine, without bugging, and very helpful, friendly and fast support. Ajit and the whole Webkul team works hard to be sure their customizations are integrated correctly and the consistency of their support is top notch.